Today I sat down with brush in hand in order to make my destroyers ready for a fight tomorrow. But, an urge stopped me. The urge to paint some yellow marines! Thankfully, it had been decided that the dead astartes on the Tomb Stalker base should be Fists, so the urge was fulfilled without having to do something non-Necron. Beautiful. So now I can go on and finish those destroyers... stupidity since they won't be a part of my starting force for our campaign, but that haven't stopped me before so why now? You should make all your bases this awsome. 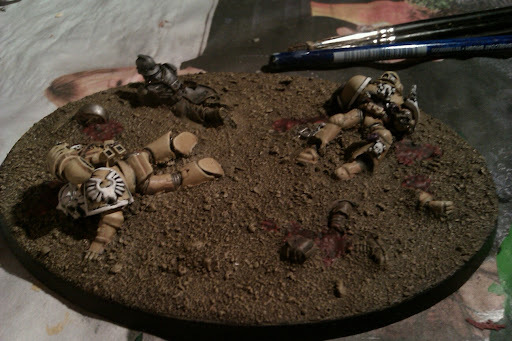 Should there be scarabs on the base? On the question I would say YES! I believe its more important that you do what you like then nothing at all. When you do what you like to do you never stop to impress us! Oh, scarabs would be super nice! I would just let it be how it is if I was making it. But I know how great your bases with some scarabs on them look, so I definetly vote yes!